Do you ever have a program where you hope you WON’T get a huge crowd? That was this month’s Toddler Art for me. I had two very fun crafts planned, but both crafts required prep work that took way too long. Seriously. I started prepping for these crafts in NOVEMBER all the way up to the day before the program. And even with all of that prep time, I only had 61 crafts prepped instead of my usual 75. So I really wanted small crowds for this one, and the library gods heard me because I only had 23 toddlers with their adults. Hooray! Yep, the bigger day cares and preschools were a no show again. But, considering that we just got back from the holidays, and considering it’s freezing outside, that’s to be expected. I also haven’t gotten around to sending out my letters about a special Toddler Art time for them, so that might be part of it too. Children dip pipe cleaners in paint. 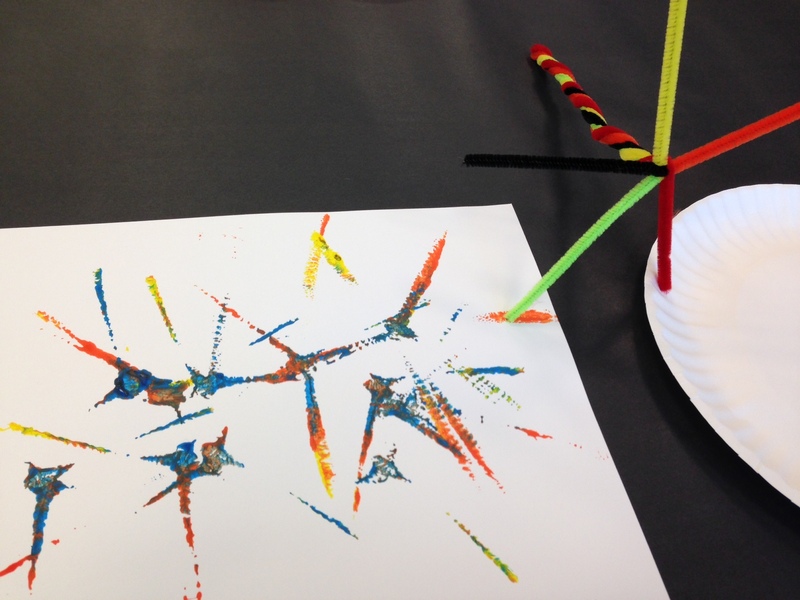 Children stamp pipe cleaners on paper to make firework design. 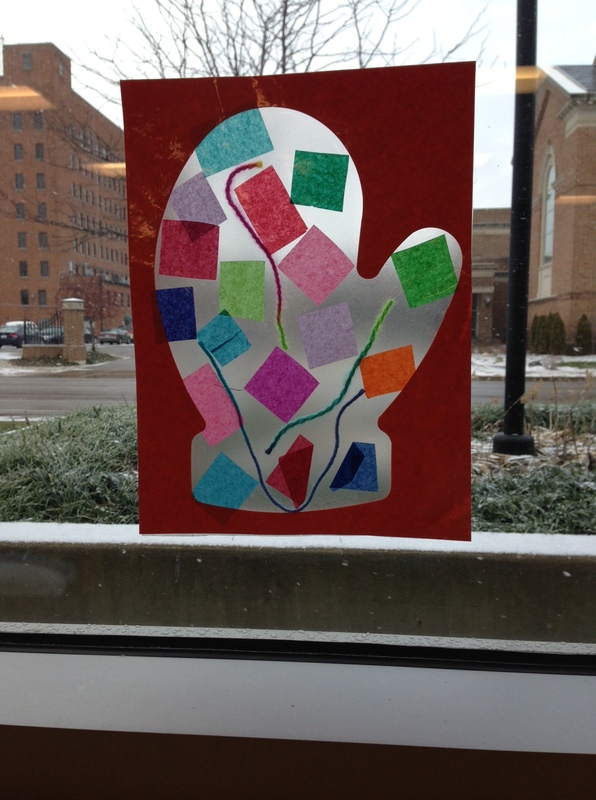 I loved watching kids get creative with this one. Many stamped their pipe cleaners the way I demonstrated, but some started using the tips and handle to paint. One little boy made sure that the ends of the pipe cleaner were one color and the center another to make a two-toned firework! This was the craft that took forever to prep! Contact paper crafts are a huge hit with moms because they’re completely mess free, but contact paper is cumbersome when you’re prepping these crafts. The craft was a huge hit, but I’m probably going to wait a long time before I do a contact paper craft again. Pipe cleaner fireworks! How awesome. Thank you for sharing these ideas AND how they went! The pipe cleaner fireworks were so fun! And cheap! And they held up really well, even with toddlers!